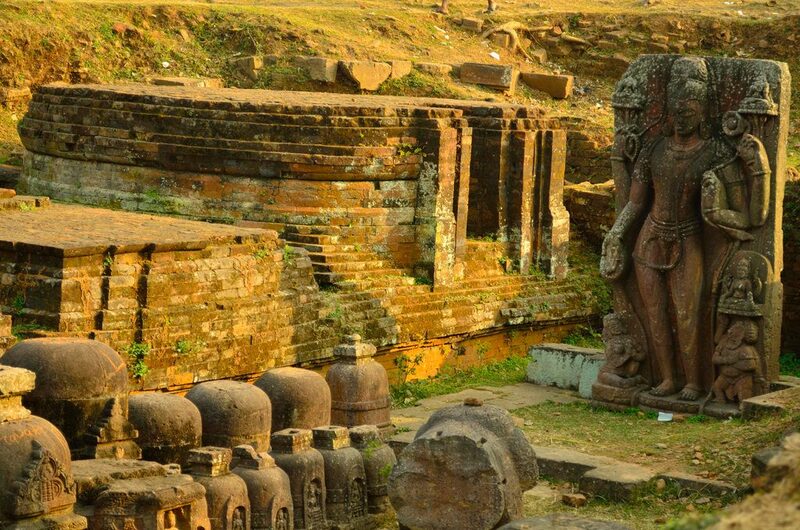 Strewn around with monasteries, stupas, relics, seals , stone tablets and statues, these hills were referred to as Ratnagiri or the hill of precious gems, Lalitagiri or the red hill and the Udayagiri, the hill of the rising sun. 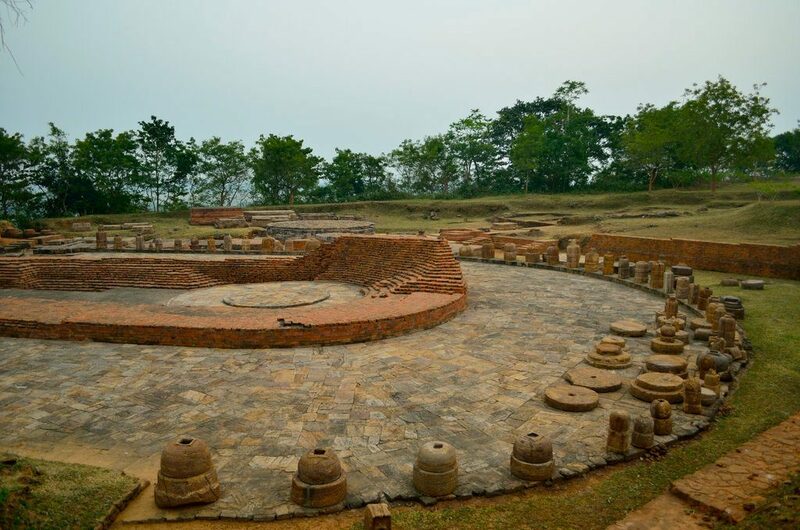 It is believed that Hiuen Tsang in his chronicles referred to the Diamond Triangle of Odisha as “Pusipokili, a place of learning perhaps referring to ancient Pushpagiri University that can be compared to the likes of Nalanda. 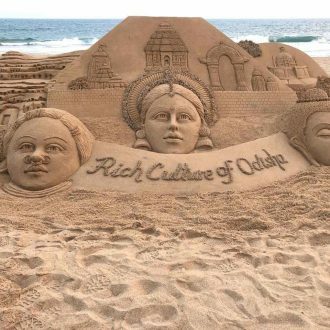 It is now believed that he is referring to the Diamond Triangle of Odisha- Lalitgiri, Ratnagiri and Udayagiri where the university was once located. 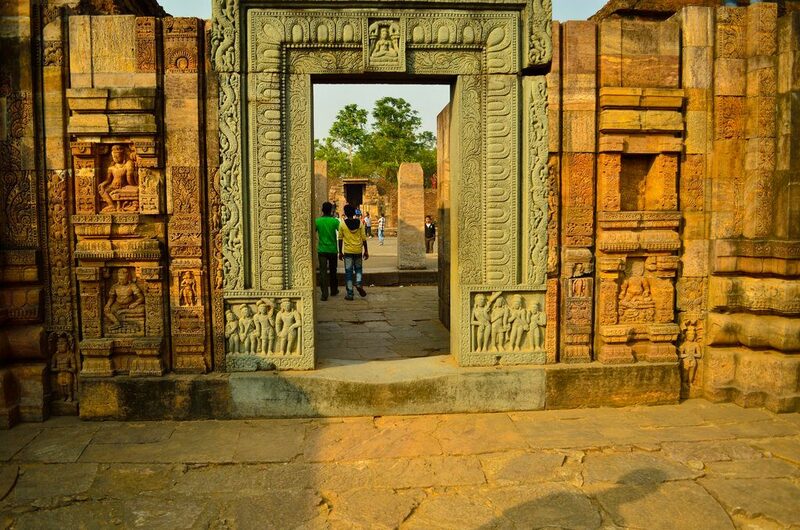 It is almost early morning when I enter Ratnagiri, one of the most excavated sites among the three sites that make the Buddhist triangle of Odisha. 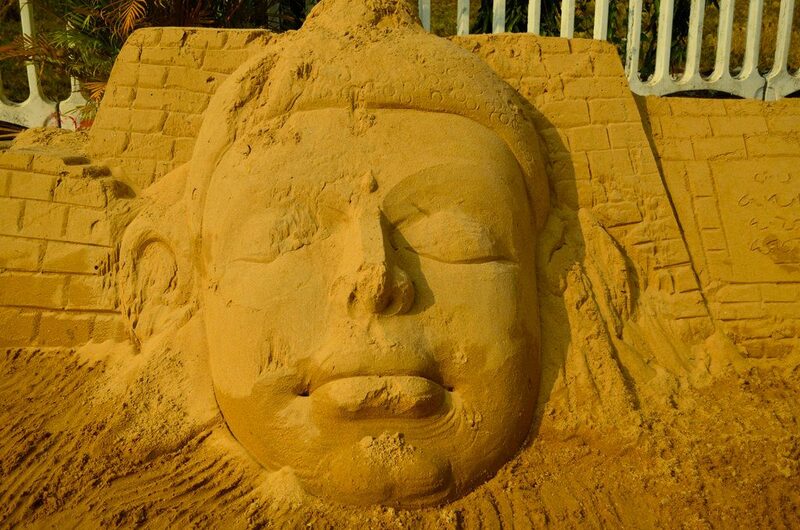 The first thing that I see is a massive sand art . 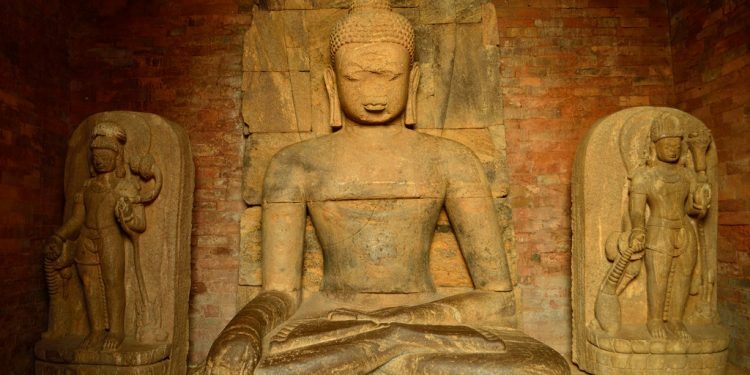 Excavations have unearthed two monasteries and one large stupa followed with several smaller votive stupas all built in the period between 5th-13th centuries. 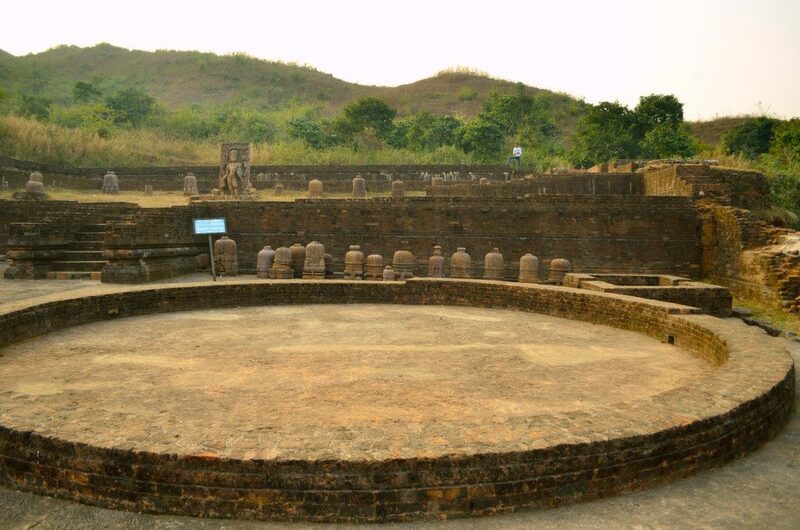 Ratnagiri is one of the most popular sites of the Diamond Triangle of Odisha. It housed a Buddha monastery or a mahavira which was built in the 5th century and its strategic location helped the monks stay here safely without much fear of invaders .I wander around and head to the first monastery , a popular Buddhist monastery of Odisha among tourists, where an ornate door , replete with sculptures carved in green granite leads me to a courtyard. 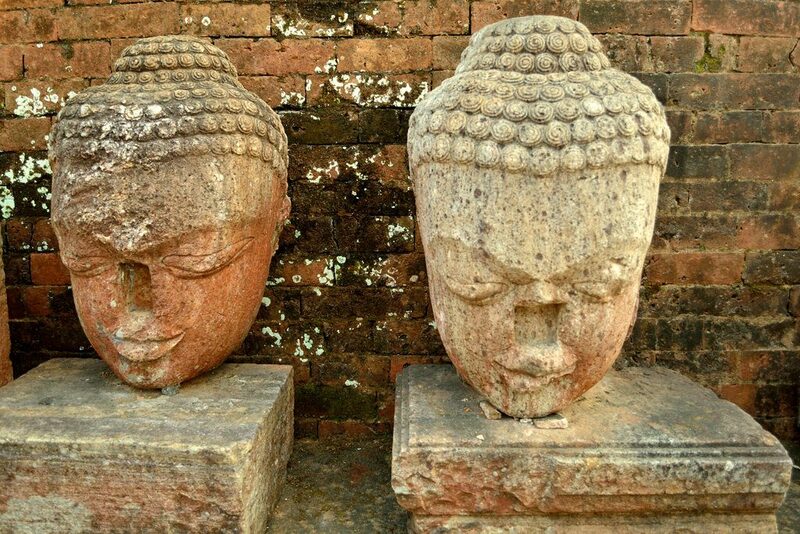 These heads probably resemble the ones found in Borabodur in Indonesia or Anuradhapura in Srilanka. A massive Buddha statue stands here. 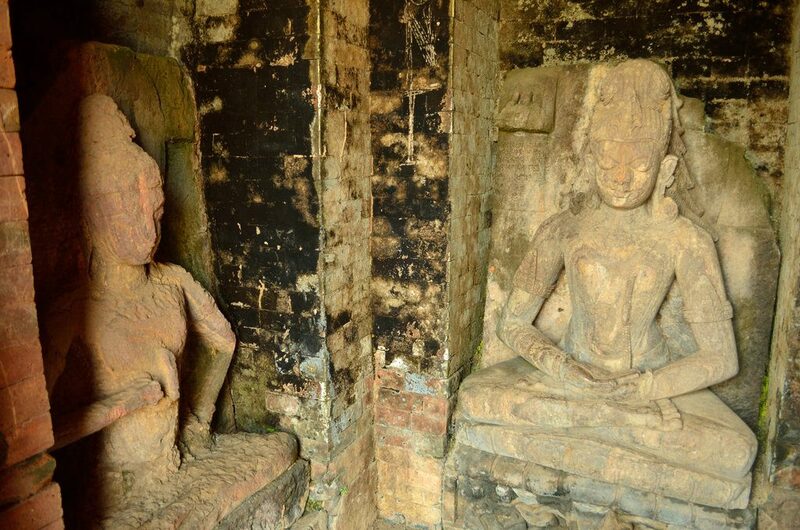 Walking around the Ratnagiri Buddhist Monastery, I see statues lost inside dilapidated cells. 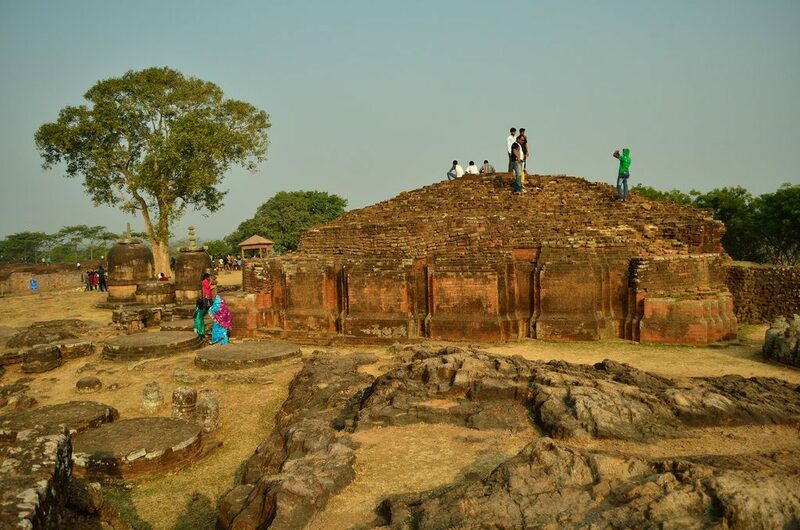 I stop by at the second Ratnagiri Buddhist monastery but the most important monument here is the giant mahastupa surrounded by several smaller votive stupas, believed to have been built around the 9th century. 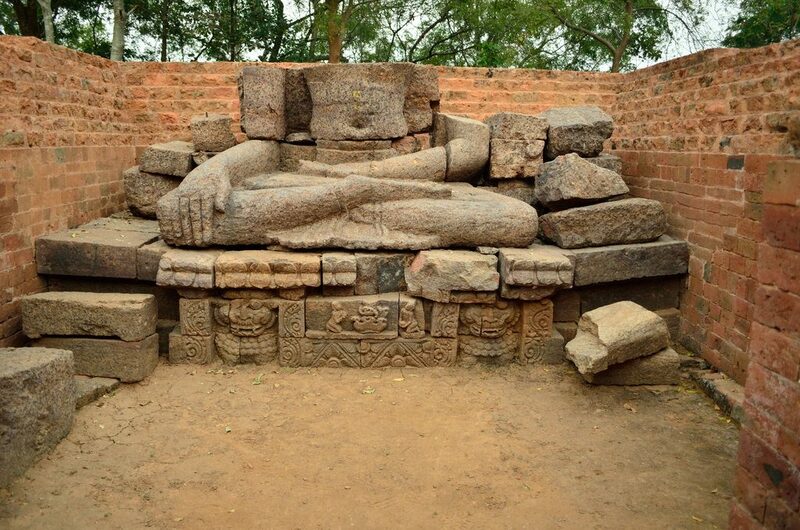 Historians however say that there was an earlier stupa here erected by the Guptas. There are smaller stupas surrounding it, arranged in circles. 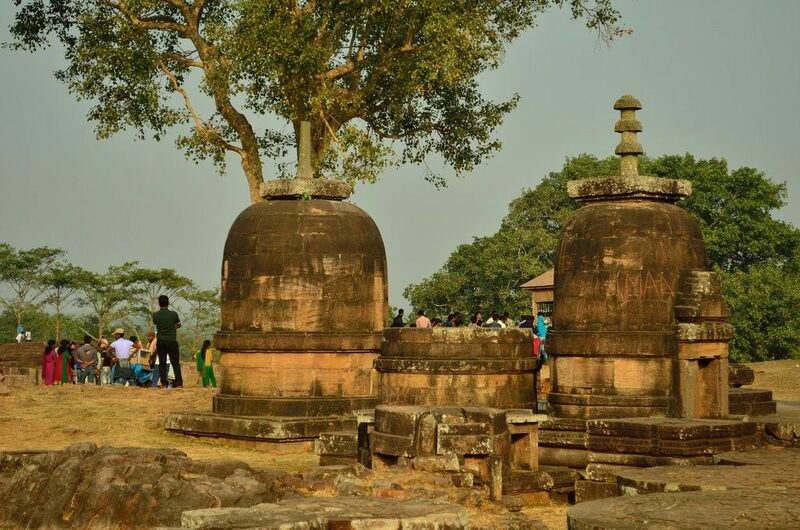 Historians believe that the architecture style of the Odisha inspired the stupas in Borabodur in Indonesia which were probably built much later. Standing atop the hill, I take in the entire view. The entire site is steeped in antiquity and lost in silence. Statues lie scattered everywhere. 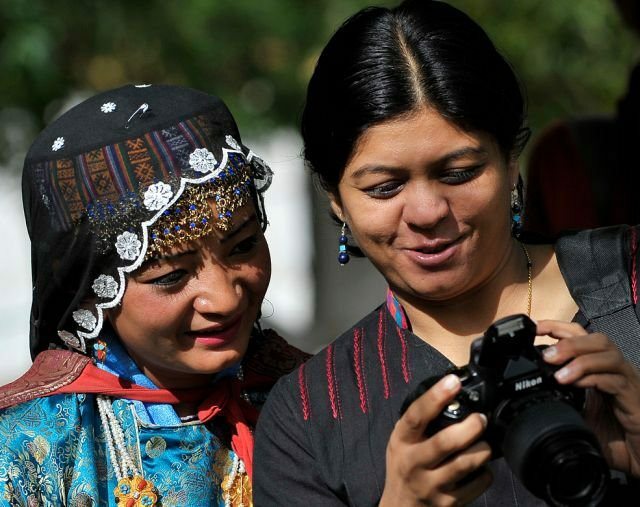 People pose for photographs. 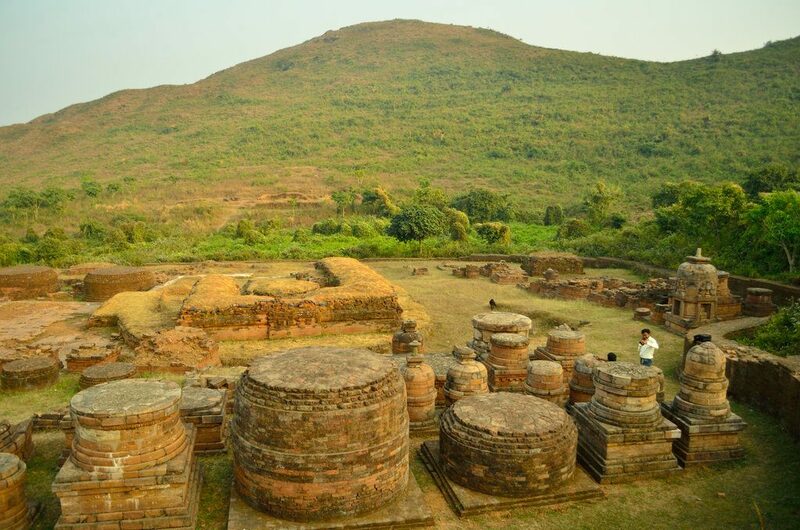 This site was probably popular at one time as an ancient Buddhist monastery in Odisha. A photographer stands precariously on the ornate gateway, oblivious to the damage that he is causing the structure. Another tourist sits in the shade of the tree and watches silently. 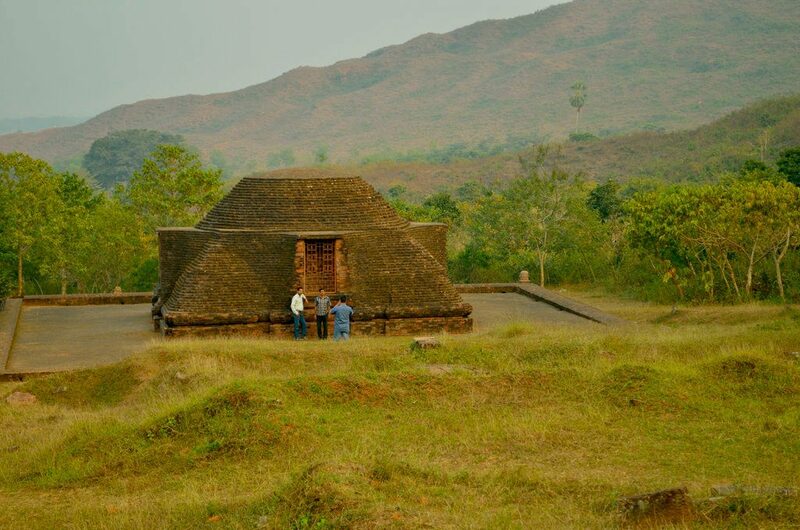 My next destination of the Diamond Triangle of Odisha is Udayagiri. I leave Ratnagiri to visit the largest excavation site Udayagiri where the lush greenery carpeting the slopes of the hills greet me. The site is wrapped in silence but for a few picnickers. 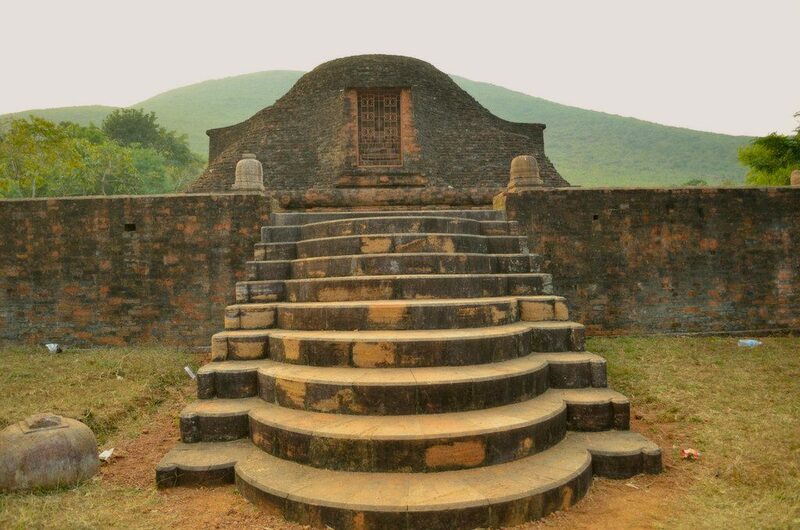 Udayagiri known as Madhavapura Mahavihara was a prominent centre of Buddhism between the 7th and 12th centuries. The name was carved on several seals excavated from here. 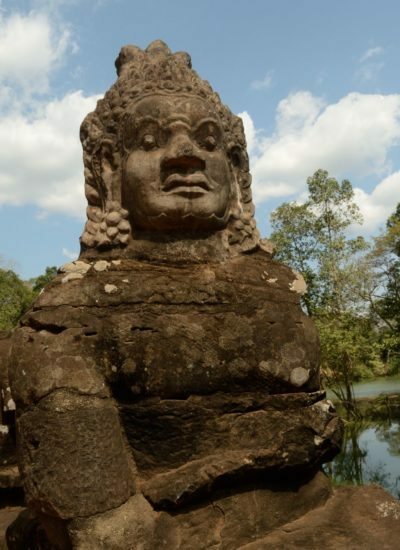 Walking along a path lined with trees, I see several stupas, monasteries and sculptures from the Buddhist pantheon of deities lying in the open. 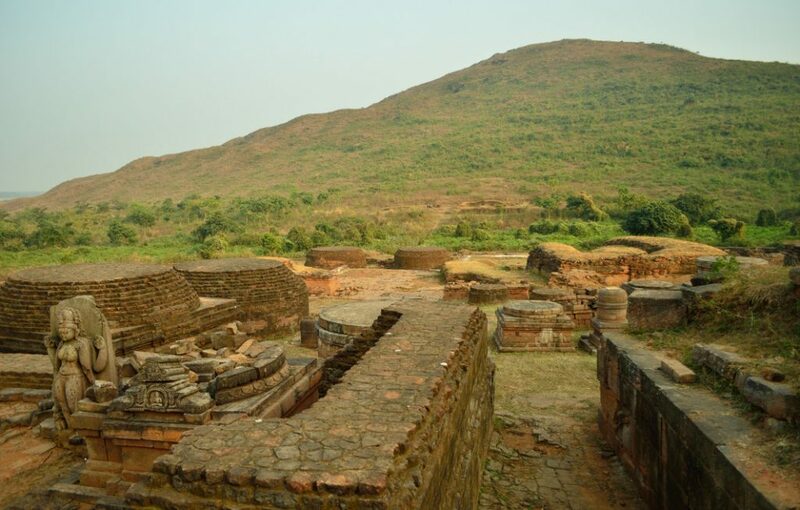 There is Udayagiri 1 and Udayagiri 2 and I almost lose my way walking amidst the many detours to reach them where you can see the erstwhile ruins of the Buddhist Monastery in Odisha. A brick stupa housing a large statue of Buddha greets me . There are three smaller Buddha statues in three cells lying here. They are probably representing the cardinal signs or the different forms of Buddha. 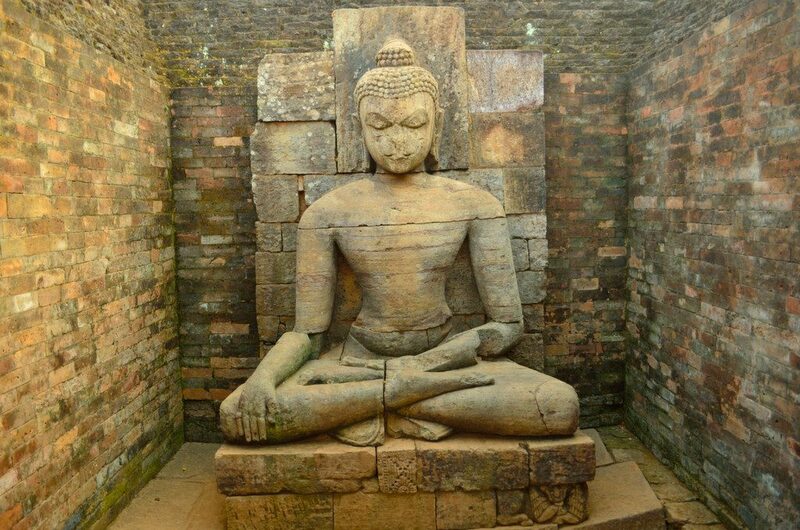 I walk past the scattered ruins, an open space with a small step well and stone carved gates to cross to the opposite side where a massive Buddha stands in the open without a roof. 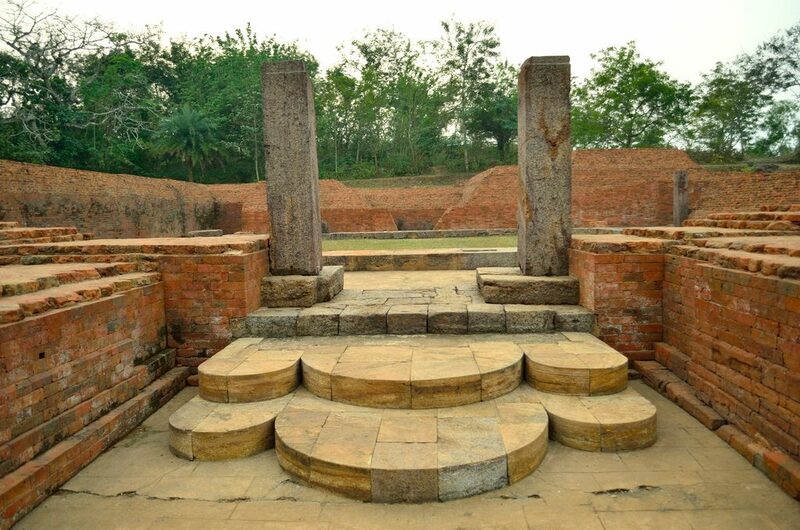 There is a Chaitya Griha here with several smaller stupas. I linger here for a while and finally leave. 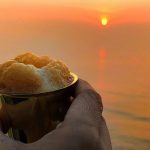 Finally it is almost evening as I visit the third site amidst the Diamond Triangle of Odisha. I enter the portals of the oldest Buddhist site that has monuments dating back to the 1st century. 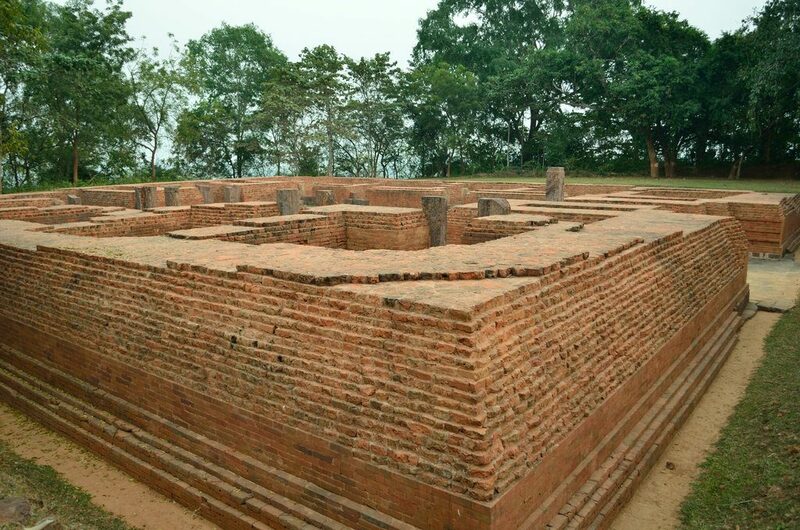 Lalitgiri is also believed to be the most sacred among the three sites as it unearthed a massive stupa where a relic of Buddha was discovered – his teeth in the form of a bone inside a stone casket. 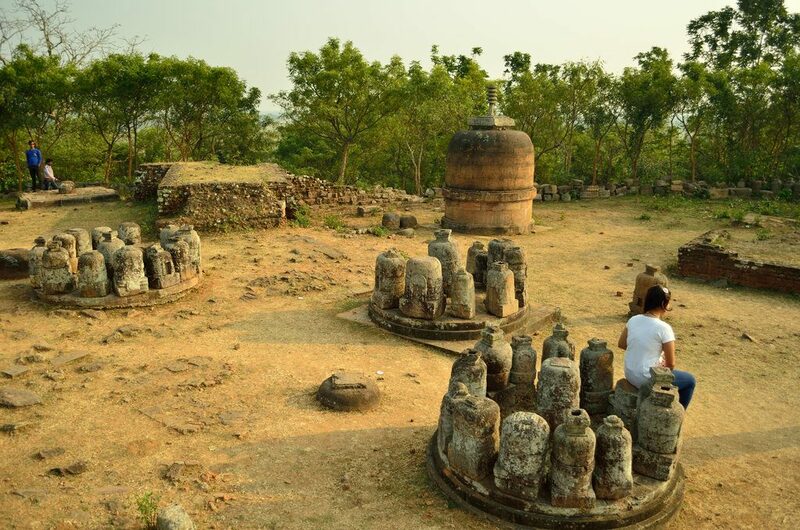 There are four monasteries excavated here besides a Chaityagriha surrounded by votive stupas. I walk from one site to another and find a headless sculpture in a cell. The monasteries are virtually empty and the sanctums have no deity or carvings. I stop for a moment at the Chaitya Griha where the tooth relic was housed. I finally head to towards the main stupa here. Climbing a set of stairs, I see the circular stupa from where I get a bird’s eye view of the entire landscape soaked in greenery. 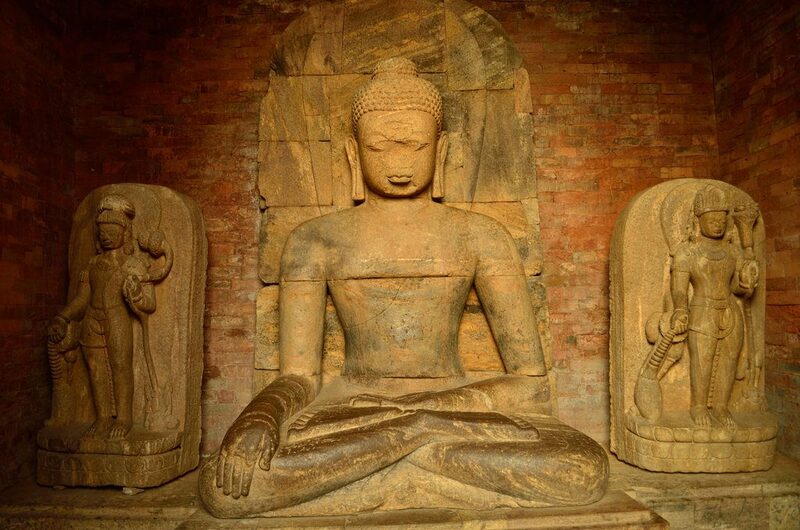 A visit to Lalitgiri is not complete without a tour of the museum which houses several sculptures including the casket with Buddha’s relic. . 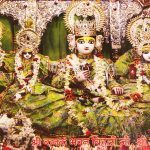 It is believed that the casket was also filled with precious stones and gold as well . Soon dusk comes ushering in and it is time to head back to Bhubaneshwar. For a moment I lose myself in the stupas and monasteries that stand amidst the trees while the ruins have a sense of timelessness about them. 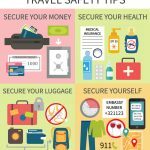 Nicely written, though we might not be able to visit the places ourselves, your naration has made us feel as if we are in the place in person. A very beautiful post. 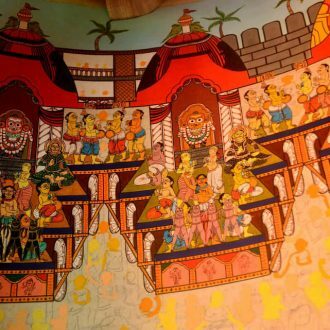 I was thinking to visit the Golden Triangle of Orissa next week. After reading this post and seeing the pictures, I am now determined to visit. 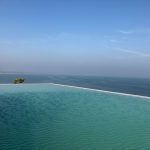 Is it possible to complete the 3 sites in a day from Bhubaneswar?